The window shows the Crucifixion of Christ together with a nurse and servicemen of the Australian Defence Forces. The installation took six months to complete. Funds were raised from the army and public subscription. It was constructed for the sum of £600, with its dimensions being 420 centimetres by 300 centimetres. Its designer was John Radecki, an 81 year old Polish born craftsman. When the window was created he was the oldest practising craftsman in that trade. 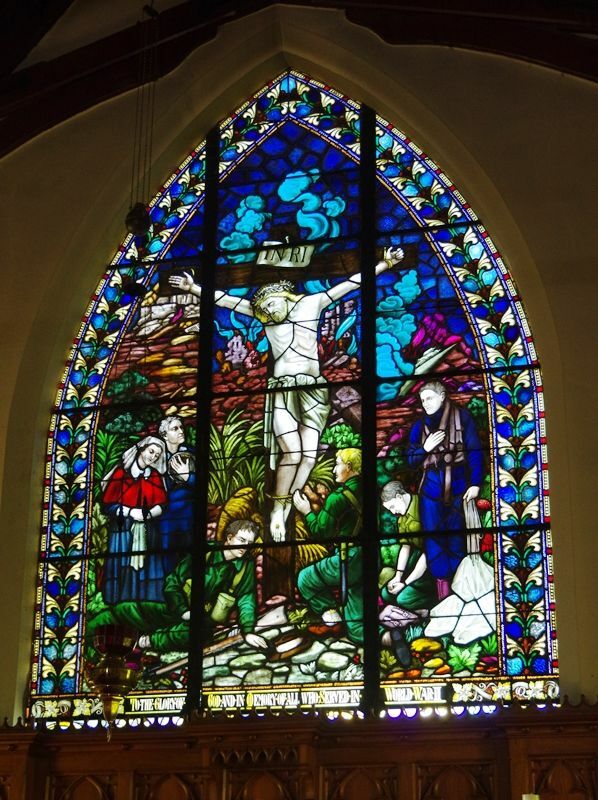 In the late 1990’s the parishioners raised $15,000 for the restoration of the window by a local glazier, Greville Wilton. The second Glen Innes memorial for the 1939-45 war was unveiled at the Holy Trinity Church by Bishop J. S. Moyes, of Armidale. It is a coloured window, measuring 14 feet by 10 feet in the eastern side of the church. The central picture is the crucifixion, and at the foot of the Cross are six figures representing all the services. A burning aeroplane and falling masonary (sic) are symbolic of the ravages of war. The window was made by Mr. John Ashwin, of Sydney, and installed by Mr. J. Westwell. More than half of its cost, £660, has already been raised by public donation. Glen Innes Examiner (NSW), 14 December 1946.